I have seen some "old" dogs (15-16 years old) that are still full of life and energy, yet I have also seen some younger dogs that are slow, sluggish and overweight. So, how old is "old" for dogs? Hard to say, really, as dogs are individual in the way they age. Generally speaking, a small dog under 20 pounds may start aging around 9 or 10. Larger dogs begin to show their age at around 7 or 8. We all want our four-legged friends to be with us for as long as they can, and we can do that if we make sure that they are fed nutritious foods and supplements, have regular exercise, and receive lots of TLC! This page focuses on the general old dog care that we can give to our companion. 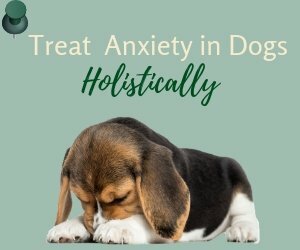 This includes things we can do for our old dog to keep them healthy and comfortable, as well as behavioral patterns and health conditions that we need to monitor on a regular basis. Feed our pets natural and nutritious foods. Add herbal and other dietary supplements to their foods. Keep their weight down - don't overfeed them. Match their caloric intake with their level of activity. Give them more frequent toilet breaks. Keep their teeth clean by daily brushing or using other dental products. Groom and bathe them frequently. As dogs age, their skin glands produce less oil, which increases the chances of dry, flaky skin and matted hair. Keep them active by regular and moderate exercise. If our pets have arthritis, we should avoid activities that stress the joints. Make sure they have a warm and comfortable place to sleep. Keep to a daily routine and avoid irregular lifestyle - Older dogs feel less anxious if they know what to expect. As older dogs may have hearing or vision loss, do not move too quickly into their space or make sudden movements that might startle them. Take them to the vet for regular medical check-ups - at least once a year, preferably once every six months. Monitor their health and behavior on a daily basis. As our pets age, we have to be more vigilant in preventing them from developing chronic diseases. 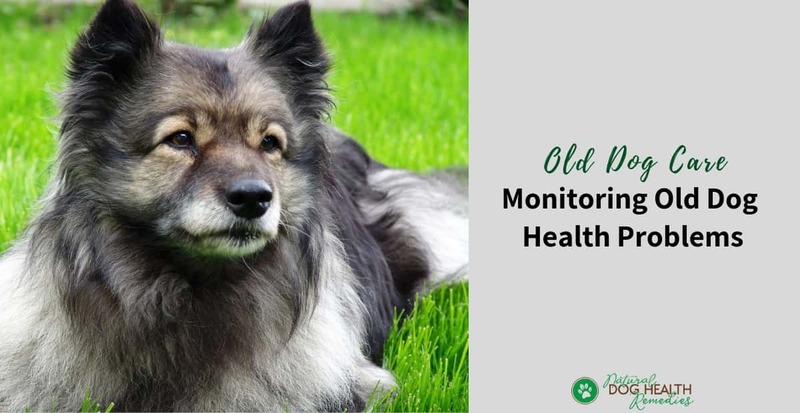 Daily monitoring both the physical conditions and behavioral changes in our old dog can allow us to identify potential health problems at an early stage. If you notice a sudden but persistent change in your older dog's eating habits, such as eating more (or eating a lot less), having difficulty in eating harder dry foods, drinking a lot of water, etc., then you should consult the veterinarian for possible health problems. Any sudden loss or gain in weight is also an indication of potential health problems and a visit to the vet is called for. Monitor your older dog's weight by weighing him at least once a month. Check your dog's gums and teeth while brushing every day. Watch out for any broken or loose teeth, swollen or bleeding gums, or any ulcerations in the mouth. Check also his breath. Bad breath can be an indication of health problems as well. Take 5 to 10 minutes every day to groom your dog and, while grooming, check his hair and skin conditions. Watch out for extremely dry hair or dry skin, sudden increase in hair loss, and any abnormal odors. 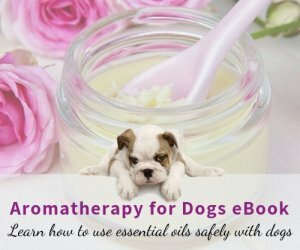 Give your dog a massage regularly. Not only will he "ooh and ahh" with pleasure, you can also take the opportunity to inspect his body - look out for lumps, bumps, or non-healing sores on the body. Be sure to monitor your older dog's toilet habits. Look for signs of urinary incontinence, chronic constipation, and chronic diarrhea. Also, watch your dog while he is "doing his business" to check for signs of pain while urinating or defecating. In addition, don't forget to check for the consistency, color, and odor of the wastes. It is natural that as our dogs age, they will move slower and tire faster. However, we should monitor their mobility closely so that timely action can be taken before they succumb to crippling ailments such as arthritis. If they are having difficulty going up and down the stairs, or if they are limping or show signs of lameness, we should get veterinary help immediately. In addition, we also need to pay attention to the coordination of movement in our older dogs. We need to take our dogs to the vet if they start bumping into things or losing their balance frequently, since this may indicate the onset of "doggie Alzheimer's" (canine cognitive dysfunction). Sometimes, a brain tumor can also cause a dog to lose their coordination. 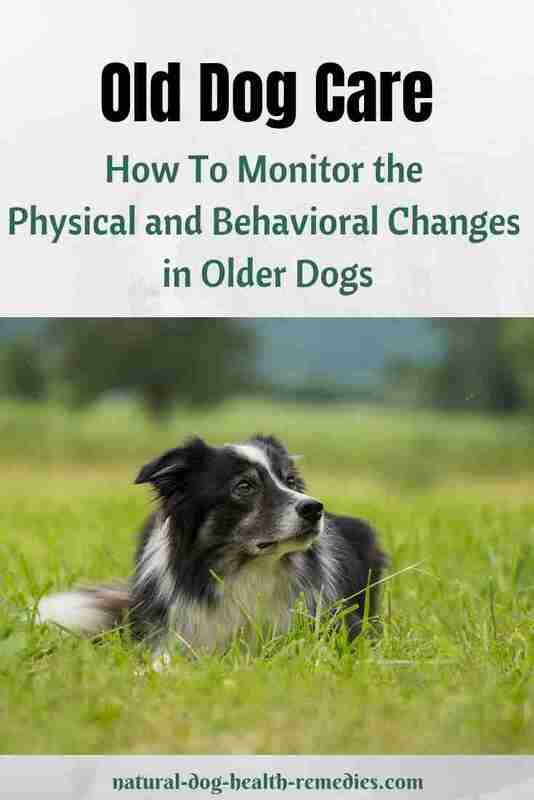 Old dog care also includes monitoring any sudden change in our older dog's temperament (e.g. becoming aggressive, depressed or suddenly developing signs of separation anxiety). Sometimes, sudden behavioral changes can also be indicative of deteriorating physical health. 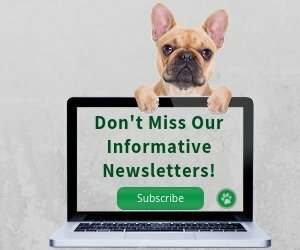 For more information on behavioral changes in aging dogs, please visit this page. You may have heard about resveratrol and its anti-aging effects on people. How about giving resveratrol to our aging dogs? Will it be effective? Click here to find out!